"Charley Miller at the Cleveland Sportsman Show "
A black and white photograph of Maine guide Charley Miller at his cooking demonstration booth. 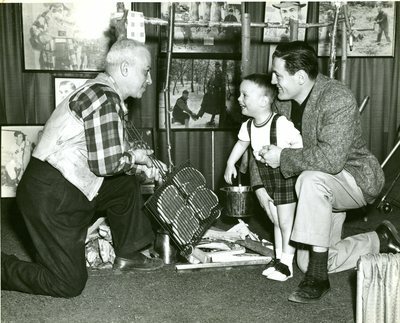 A typed caption on the back indicates this was at the Cleveland Sportsman Show, Cleveland, Ohio, but doesn't identify the other man or child. No date.